tournament in a matter of minutes. Cool features you get with TTScore. Customize each tournament to your needs by setting different options per tournament and category. You can also quickly monitor your tournament through the featured stats. A plethora of reports on every aspect of the game such as Group games schedule, KO tree with schedule, Final results, Game Slips, official or unofficial and many more. Every event is unique, thus, for every event a unique Webpage is created on the front end allowing you to keep everyone informed in real time with no extra hustle. 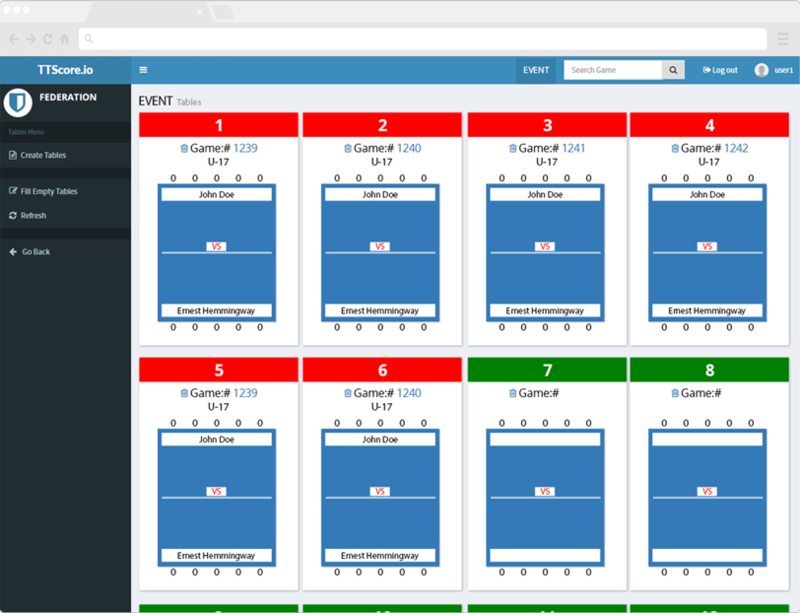 Allow your event website visitors to watch live score of any game they like and upgrade the quality and quantity of information they get by offering them game and player stats in real time. Schedule the whole event with the Scheduler. Edit date, game time and starting time and let the smart auto-fill do all the rest based on your available tables. If you prefer, you could also do it manually. TTScore.io is the only Table Tennis Tournament Manager with automated draw system that utilizes all the Official ITTF Draw Rules. Federations already use it on their official events. Populate the participants list of your event automatically by giving access to the online entry form. Participants enrol on their own by adding on the online entry form all the necessary information you request and your event participation list is ready. 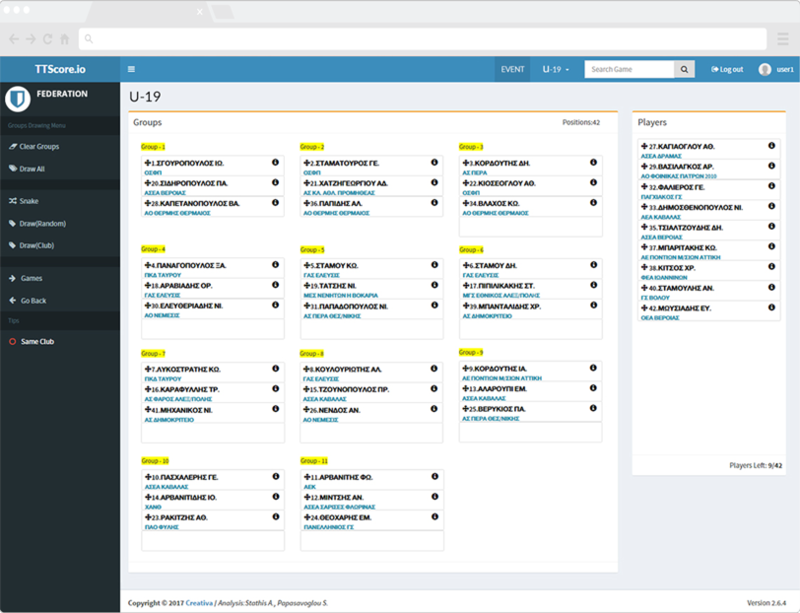 Integrate TTScore.io in your championship and enjoy the benefits of the Automatic Ranking Update. After every event ranking is automatically re-calculated and you can publish it whenever you like. Create and control every aspect of your events from anywhere and whenever, since it is cloud based. Instant access to every bit of information from any device, anywhere in real time. 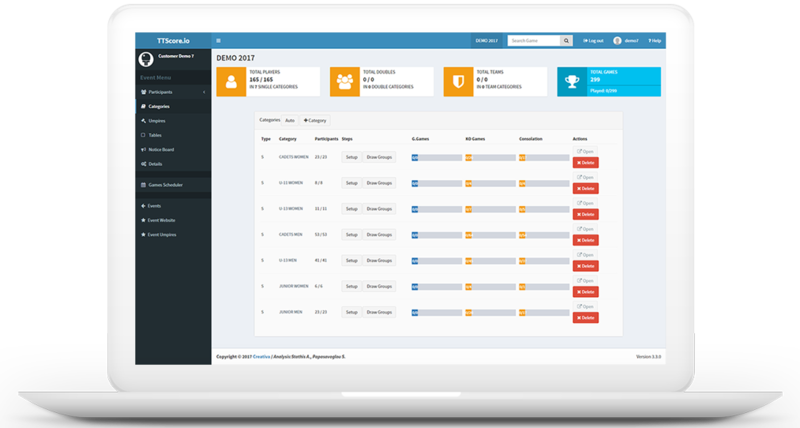 Private access for teams with players management system and easy tournaments sign-up. Register umpires and update scores in real time with the umpires scoring app. Save time work and effort with our advanced automatic draw system. It is the only system utilizing the official draw rules of ITTF along with the ranking and a variety of draw options. Finish the draw phase of your tournament in a matter of minutes, no matter the number of competitors, and let the participants get informed in real time through the event page. The system is so flexible since it is designed based on the needs of Table Tennis Tournaments, that even lets you create tournaments with or without “Byes”. Both automatic and manual creation settings are also available. Our interface is designed from scratch in order to offer you total control in the easiest way possible. You can have the absolute control of your venue in a glimpse of an eye through our tables manager. Only one screen is needed in order to fill empty tables, associate tables to games, keep track of matches and score, edit-add-delete information and many more. TTScore.io works great on any device. Give the freedom to your participants and visitors to visit your event page from any device they prefer.